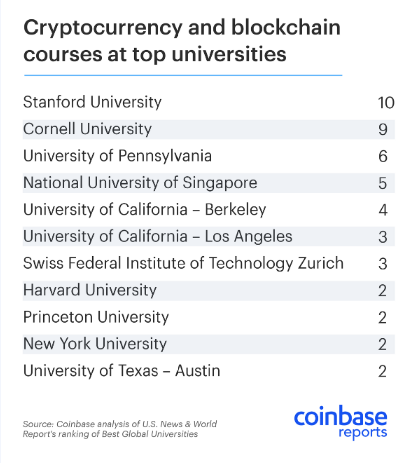 Coinbase has recently reported that 42% of the World's top 50 universities offer at least one course in crypto or blockchain. The report was posted on their blog which discusses the rise of crypto in higher education. The digital currency exchange, which is headquartered in San Francisco, California, partnered with research firm, Qriously in asking students about their opinions on crypto and blockchain. Feedback related to the research found that a diversified range of student majors were interested in crypto and blockchain with courses being added across a variety of departments. The growth in blockchain interest has seen New York University's blockchain course grow from 35 students in 2014, up to 230 students enrolled for 2018, where the course will be taught for both semesters to meet interest from students. The in depth report also covers statistics based on 675 U.S. students, a comprehensive review of courses at 50 international universities, and interviews with professors and students. The results show that 9% of students have taken a cryptocurrency course, 18% own cryptocurrency, and 26% would be interested in taking a cryptocurrency course. For a more in depth analysis of the research conducted by Coinbase, have a look at their blog here. Would you take a cryptocurrency course?